An article about Jazz in the Neighborhood written by Emily Hayes appeared online in thefrisc.com on November 27, 2018. Read Jazz in the Neighborhood presents emerging artists in SF, by Jesse Hamlin, published in the San Francisco Chronicle, January 17, 2018. Mario Guarneri’s father had a no-tipping policy at his union barbershop in Berkeley’s Elmwood district, where a fair wage was paid. Guarneri takes the same proud stance at Jazz in the Neighborhood, the nonprofit he started five years ago, banning the tip jar at its concerts and at other shows it subsidizes through its promising new Guaranteed Fair Wage Fund. “It’s demeaning,” says Guarneri, the esteemed Bay Area trumpeter who sat in with Louis Armstrong onstage at Cal at age 13, played for 14 years with the Los Angeles Philharmonic and knows all about the tip jar from years of playing jazz gigs in the Bay Area. He worked with great musicians who were barely compensated, often not knowing how much they’d earn until the night was over, when they’d get a percentage of the door or just split the tips. For six or seven years, Guarneri performed with top Bay Area players Sunday nights at the now-defunct Book Beat in Fairfax, where he lives, and paid them from his own pocket. “I thought it was time to give a little back, not that I’m a millionaire,” says the affable trumpeter and composer, who played the trumpet solos on the soundtracks to “Godfather III” and “Lonesome Dove,” among other studio work, and has taught for 25 years at the San Francisco Conservatory of Music. Since its inception, Jazz in the Neighborhood, which receives grants from funders like San Francisco Friends of Chamber Music, has presented hundreds of musicians at venues around the Bay Area, paying them a guaranteed rate of $150 a gig, plus 10 percent more for the bandleader. Its Guaranteed Wage Fund pays other presenters and venues, like Bird & Beckett bookstore, up to 40 percent of that compensation for certain shows. The concerts are either free or modestly priced. “We’re keeping jazz alive out in the neighborhoods, making it accessible to people,” says Guarneri, 75, who’s presenting clarinetist Ben Goldberg’s prime quintet, Ben Goldberg School, at the San Francisco Community Music Center on Friday, Jan. 19. Joining in will be vibraphonist Dan Neville, one of the musicians in the nonprofit’s Emerging Artists program, which invites promising young players to share in the old jazz tradition of learning on the bandstand. Vocalist Shana Dinha is the emerging artist booked for Feb. 9 at Copperfield’s in San Rafael with Guarneri’s quartet featuring guitarist Randy Vincent, bassist John Wiitala and drummer Akira Tana. Then there’s the New Chamber Jazz Quintets show the nonprofit has planned for Feb. 16 at Community Music Center, showcasing three young composers and bandleaders who came out of the Emerging Artists program: flutist/pianist Erika Oba, guitarist and singer Ian Faquini and drummer/vibraphonist Dillon Vado. “If they have enough places to make a living here, people won’t have to go to New York or some other place,” Guarneri says. In the January 2o18 issue of Jazz Journal Randy Smith hears tales from one of the drummers most widely travelled in the swing and bop circles of the 1970s and 80s, among older generation survivors such as Zoot Sims, Sonny Stitt and James Moody. 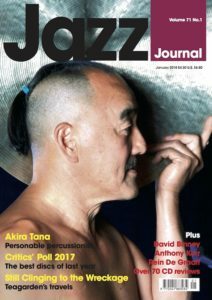 See jazzjournal.co.uk for more jazz news, reviews and features. Jazz in the Neighborhood seeks a self-reliant and reliable person to market its events and other programs. Duties include composing a weekly email newsletter (currently via Mailchimp); maintaining the email list; managing the Facebook page; submitting events for calendar listings; writing and sending press releases; website updates; and other related activities. In addition to being dependable and a self-starter, qualifications include facility with social media, ability to navigate various media websites, basic Photoshop skills, familiarity with html code, a good graphic design aesthetic, command of proper English spelling and grammar, attention to detail, and ability to use Google docs and sheets. Interest and knowledge of the Bay Area jazz scene is highly desirable. This is a part-time hourly position, which should average about 5 hours per week, but not more than 30 hours per month. Work will be done via telecommute, although attendance at occasional staff meetings in the Berkeley area may be requested. Reports to the JITN Administrator. Office space, equipment, and software are not provided. Read it here: A New Model for Paying Musicians a Living Wage, an East Bay Express article by Burt Dragin. Andrew Gilbert features Bay Area guitarists in his Mercury News article, “The Guitar is dead? Don’t tell these Bay Area jazz cats.” Of those mentioned, Terrence Brewer is a member of Jazz in the Neighborhood’s Artist Advisory Committee; John Schott is a Jazz in the Neighborhood member, supporter, and roster musician; and Mimi Fox will be a featured performer at the Jazz in the Neighborhood fundraiser on September 24th. Andrew Gilbert features Jeff, Sandy, and Natalie Cressman in his Mercury News article, “From Santana to jam bands to Brazilian jazz — Cressman clan does it all.” Jeff and Sandy have performed with Jazz in the Neighborhood on several occasions, most notably as Homenagem Brasileira at Piedmont Center for the Arts and in an ESO show with guest artist Spok at Doc’s Lab. JITN’s Emerging Artist program gives aspiring jazz musicians an opportunity to take part in the time-honored tradition of learning on the bandstand. By performing on stage with established jazz musicians—either as featured players or opening acts—those selected for the program receive valuable real-life experience in addition to monetary compensation. John Shifflett’s passing has left a great big hole in my life. John was a wonderful person — funny, generous, humble, an astute observer of life’s details. He was also a hell of a musician. Like Big Sid Catlett said, “I can swing seventeen men with one wire brush and a phone book.” You got the feeling John could swing an entire band by just standing still. In a funny way, I didn’t really think of John as a bass player; he was just John Shifflett. Sometimes you needed a bass player and sometimes you needed John Shifflett. He was a master of contrapuntal groove. The melodies he created on the bass were carved out of metal; they were functional objects. You’d be playing a song and you’d be astonished by John’s lines — he had found the inner shape and substance of the song. It sounded perfectly obvious when he played it, but you had never known it was there. I regret John’s passing, but one thing I don’t regret is that whenever we played, I tried to tell him all of this, that I loved him and that I learned something new from him every time. We will really miss John Shifflett. I always loved hearing John sing along with his bass lines. I remember the first time I got to do a gig with him, perhaps late 1980s or early 1990s — I was so excited to be playing a gig with John Shifflett! Later I called him to play bass with me on a New Year’s Eve gig in 1999, but he chose to decline a really good paying gig to spend time with his wife. The last gig I played with John was at the De Anza Hotel Hedley Club, perhaps a couple of years ago, with Ed Johnson, I believe. I got to chat with him some on the break. I didn’t realize it would be the last time. When I first encountered it, in the midst of one of my first gigs with John, I was startled, amused and curious. What kinda guy would holler like that in the middle of playing a gig? I didn’t do that. No one I knew did that. I eventually came to realize what it meant. It was an instinctual utterance of a musician who was deeply attuned to the intense expression occurring at that very moment on the bandstand.Interestingly, even though that holler was bold and surprising, he was actually a very humble and private guy. I will sorely miss John’s holler, but I will carry it with me forever. I get it now. Thanks, John. I learned more from John Shifflett than any other person while in college. And he never said a word. John Shifflett was a great bass player as well as a wonderful person. He was warm, funny, smart, kind, generous, an altogether fine man. I had the pleasure of telling stories accompanied by a trio (John, Jason Lewis, and Steve Slagle) on a number of occasions; it was probably the performing highlight of my life. John not only knew how to support a band, he knew how to support a storyteller. I will miss him. On May 13, 2017, we lost Jenny Meltzer, vocalist, composer and arranger of the vocal trio Pastiche. Jenny was my close colleague, along with Becky West. Although we were most active in the ’80s and ’90s while in the Bay Area and touring the US and Japan behind several CD releases, we continued to record together on and off as recently as last December. Jenny was the daughter of renowned poet and musician David Meltzer and Tina Meltzer, also a singer and musician. Jenny had a beautiful voice and incredible pitch. In our early days of singing more straight ahead, I remember our arrangement of “Moment’s Notice” where she sang a Coltrane solo with our guitarist, perfectly articulated and in tune. Later on as we experimented with fusing Latin and other elements, Jenny composed some beautiful tunes that we recorded on our second and third CDs: “Remember That,” “Destination Drive,” and “When Will There Be.” (The last two composed in collaboration with her husband, producer/composer Nic. tenBroek are among my favorites.) After moving to LA in the late ’90s, Jenny continued working with Pastiche and also sang on various TV and film soundtracks and CD projects. Those who remember the sound of Pastiche always remark on the blend and precision of phrasing, and indeed, we were like musical sisters where the blend and phrasing is automatic even when we hadn’t sung together in months or even years. Jenny quietly fought a valiant four-and-a-half year battle with cancer, letting a very close few know what she was going through. We will miss her beautiful sound, her elegance, and her sense of humor. My dear friend and longtime keyboardist Loren Linnard passed away in November from a brain tumor. A tragic loss, he was relatively young (mid fifties). Loren was incredibly humble, kind, generous, and a rare virtuoso with perfect pitch (which he never bragged about). In addition to being conversant in jazz, classical, pop, Latin, and Brazilian styles, he was also a prolific composer of musical theater pieces. In my group, the Silver Moon Big Band, Loren would often play keys, kick bass, sing backup, and run the PA all at the same time. Amazing! Loren Linnard was a fantastic artist and a wonderful human being. We all miss him so much. He is survived by his wife Judith and their son Dean. I had the honor and pleasure of being Neel Foon’s one-on-one guitar instructor for almost four years. I watched him blossom from a talented, but shy, freshman guitar player at Oakland School for the Arts, into an articulate, confident musician with amazing talent as a college freshman. I spent an hour a week, every week (minus a vacation here or there) with Neel, and he always had a smile on his face. He’s charming, funny, intelligent and had that smile which could light up a room. His playing had transformed into something special — he was truly a one of a kind musician. I’m honored to have been apart of his life and musical paths and feel blessed to have shared this art form together. Neel Foon was our Emerging Artist with Terrence Brewer in February 2016. He had recently graduated from OAS and was attending UCLA when he suffered a fatal injury while hiking near Santa Cruz this past April. 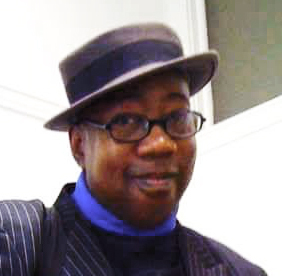 Khevan Lennon Onaje—friend, early music mentor, and sax player—passed away just this past month. He hired me for my first gig. Just played at his memorial last Sunday [April 30th]. This dedication is in memory of drummer, composer, and educator Omar Clay, who passed away from ALS (Lou Gehrig’s disease) on December 8, 2008, at the age of 73. His illustrious professional career included a stint in the 7th Army Jazz Band, which toured Germany (circa 1958-1960); being Sarah Vaughan’s drummer (1964-1966) and an original member of Max Roach’s M’Boom percussion ensemble; and later being the drummer in the Guarneri Jazz Quartet. He retired as music director of Tamalpais High School in Mill Valley in 2002. Amongst many, many memories, the most heartfelt ones became etched during the last years of Omar’s career when he played regularly with Mario Guarneri in venues around the Bay Area. When Mario learned of Omar’s diagnosis, he wrote “Requiem,” which was later recorded on the CD Tell Your Story in honor of Omar. At Omar’s tribute/memorial at the SF Conservatory of Music in 2009, Mario donned a newly purchased sports coat and graciously played a few tunes on stage. In addition to producing and releasing his CD dedicated to Omar, Mario organized a benefit with proceeds shared with the ALS Foundation. With a deep appreciation to Mario Guarneri for his love, continued support, and assiduous dedication to jazz, music, and the formation of JITN. Omar was a dear friend, a colleague, and a mentor. It all started when I gathered my courage to call him for a two-hour steady gig I was putting together in Fairfax at the Bookbeat around 2003. I paid people out of my pocket to play, but couldn’t believe a player of Omar’s caliber would drive to Fairfax for the $50 I was guaranteeing (when my finances improved, I got it up to $100). The only thing he said when I asked was “Who is playing bass?” That was the start of his mentoring. I told him I would not call him unless I got someone from his list, and the musical mentoring went from there. He became a big part of the inspiration for Jazz in the Neighborhood and that continues to this day. He wasn’t afraid to offer his opinion, and I particularly remember walking into a gig and hearing Omar say “Don’t you own an iron?”… probably more than once. 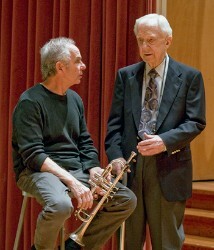 Eddie Smith was my first trumpet teacher when I started at the age of eight. He taught me everything I ever needed to know to be a professional musician who played the trumpet. Eddie’s passion was playing with Earl “Fatha” Hines and leading his own group at the Club Shanghai in SF. I heard him there with my family in the 1950s, and I even hired the band to play at events at my high school. He got me into the 49er band at Kezar and the Raider band at Youell Field. I sat next to him in the band during the shows in the Venetian Room, listening to Ella Fitzgerald and many others. Lessons went on for hours, full of Socratic philosophy, transcribing solos, playing the blues, and working diligently on every page of the Arban book. He always talked about finding the diapason of my sound and using my ears. Because Eddie knew Louis Armstrong, I had an opportunity at the age of thirteen to sit in and play a set at a concert in Berkeley with Louie and his band. Edgar Clarence Smith passed on at age 83 in 2012. Selfless, dedicated musicians like he and Omar made a commitment to their art form and entertained thousands of people with their music-making but never achieved the recognition and monetary security they deserved as professionals in their field. I hope that the work of Jazz in the Neighborhood is changing that model for the future. To me, Svend Asmussen was the first guy to really play bebop on the violin. He was playing lines as hip as Charlie Parker even before Charlie Parker played them. Svend brought the violin into being as a serious jazz instrument because he had the chops and harmonic knowledge of any great saxophone or pianist improviser. I first heard Svend with his quartet when I was fifteen years old. 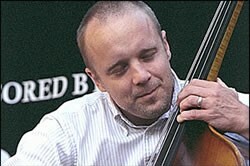 I could see what a great player and arranger Svend was, but I also remember the natural entertainer in him. He put a smile on everybody’s faces. After that experience I had the urge to start “messing around” on the violin with jazz, but I didn’t know where to start. So I looked up Svend in the telephone book, and there he was. I called him, and he told me that he doesn’t teach, and then he said, “Just listen to Stuff Smith.” Svend being truly humble and always pointing to others as being superior was just part of the way he was. Svend has had a major impact on me on every level when it comes to being an excellent musician. For the last few years, guitarist Jacob Fischer and I have toured around Scandinavia playing Svend’s music in jazz clubs and concert halls. 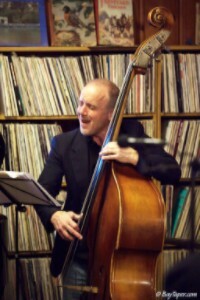 Having been a part of Svend’s group for over fifteen years, Jacob has a unique perspective and understanding of Svend’s music, which resulted in the 2016 CD release Mads Tolling Quartet feat. Jacob Fischer — Celebrating Svend Asmussen. Svend is also a superb arranger and composer, especially for the small jazz combo size. It doesn’t get much better than his versions of “Honeysuckle Rose” and “After You’ve Gone.” We have truly lost one of the world’s greatest and most original musician, entertainer, and human being. 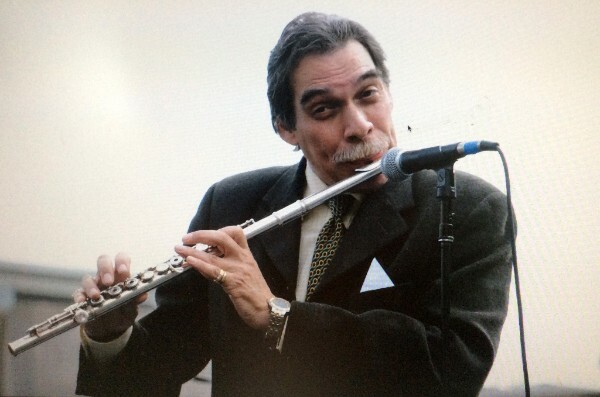 Latin Jazz flautist extraordinaire Dave Valentin passed this year. I shot this photo in 2008 at the Yerba Buena Center where he was performing with the New York Latin All-Stars. We extend our heartfelt thanks to everyone who contributed their thoughts and photos. As a member of the musicians union for 60 years and an active performer in the Bay Area since 1992 in both the classical and jazz worlds, I was disturbed that Sam Whiting, in his article entitled “State of the Unions Strong in S.F. 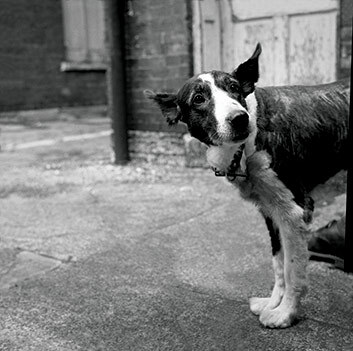 arts,” ignored the serious challenges faced by the large group of freelance jazz musicians who perform in San Francisco. Although the musicians union has done a great job of helping to negotiate contracts for members of the symphony, opera, ballet and major theater orchestras, they have done little to help freelance jazz musicians. For the most part, union-paid freelance work has disappeared and along with that so have most guaranteed wages and pension benefits. Very few freelance musicians are able to make a living in the Bay Area. Local jazz artists have never shared in the union benefits earned by “classical” musicians for a variety of reasons, most notably because they have never organized in an effective way as have their “classical” colleagues. The symphony/ opera/ballet/theater orchestras bring in much revenue to the union through work dues, and thus have a strong voice in union policies. Unions have lost their power to support freelancers in great part due to some catastrophic legal/NLRB decisions in the early 1980’s that effectively destroyed the union’s ability to represent that part of the industry. Additionally, European-based music has always found support with the upper socio-economic class. Finally, there is a disturbing media celebrity culture that cashes in on high prices, and at the other end of the spectrum many consumers have come to expect “free” music. It should be noted that there is no mention in this article of SF JAZZ, an organization that presents outstanding musicians from around the world, but at the same time offers very few opportunities to local jazz players. SF JAZZ, unlike its Civic Center neighbors, is a non-union house that underpays locals when they are hired. Finally, most venues don’t pay a guaranteed fair wage. Instead they offer a percentage of the door or ask musicians to split the tip jar — described in the article as “non-union jobs … splitting the take in a jazz trio in a restaurant.” If you do the math on a “tip jar” or “percentage of the door” gig, the hourly wages often amount to less than the S.F. city minimum wage. That is not taking into account parking, bridge tolls and travel time from places where musicians can find affordable housing. Can you imagine any other professional who is expected to work for tips? Your doctor, your auto mechanic, your plumber? Some of us musicians are trying to do something about this, and I urge consumers to do their part by joining our nonprofit and by supporting venues that offer musicians a fair guaranteed wage.